Biryani is a traditional dish of meat or vegetables layered with rice and spices. Most commonly attributed to southern Indian cuisine, there are variations of the dish found in many parts of Asia including Bangladeshi, Malaysian and Pakistani cuisines. 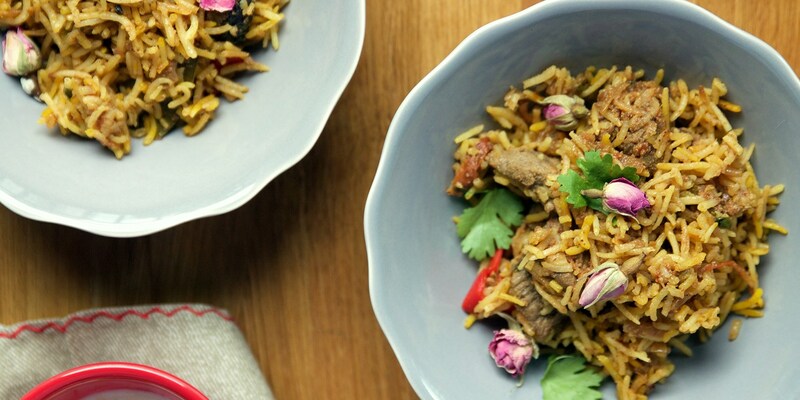 For many, biryani is the ultimate in Asian comfort food - if you like the sound of a big bowl of rich, spicy rice for supper browse our collection of delicious biryani recipes for some mouth-watering ideas. Sumayya Usmani's nostalgic Prawn biryani is inspired by childhood seafood fishing trips and flavoured with minty green masala. For a meatier option try Shu Han Lee's Rabbit biryani - with the rabbit baked whole in the pot, this recipe results in heavenly, deeply flavoured rice. For a fantastic vegetarian biryani try Vivek Singh's Hyderabadi vegetable biryani - perfect for autumn, this vegetable dish is innovatively served in a hollowed out pumpkin shell. Monica Shaw, too, leaves the meat out of her biryani, also omitting rice in favour of blitzed cauliflower for a low-carb alternative.